The sun is moving towards the west, it is just catching the mountain tops in this scene. 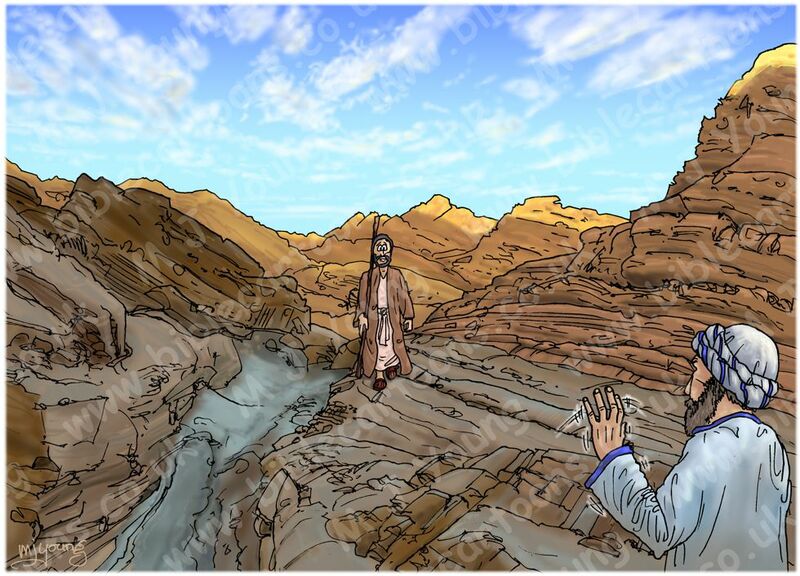 Moses is in the foreground, waving to his brother Aaron, who is walking towards him along the valley bottom. 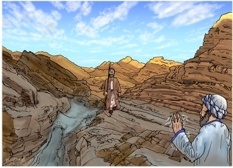 This is a simple scene, showing Aaron walking towards Moses. The potential of most individuals is generally far greater than most are willing to acknowledge. Human potential is a gift of God and can be realised by His power. Revelation does not force human agreement and commitment. Moses had already questioned God as to His identity and power (See Genesis 3:13, 4:1). Here he excused himself as unfit for the call God was making on his life. God revealed Himself as patient, yet caringly angry that Moses used every excuse no to serve. Patiently God reminded Moses that the Creator has formed all human gifts and can release them for His purposes. Even more encouragingly, God revealed that He would continue to reveal His presence as Moses fulfilled his mission. Moses had a tendency to argue with God. What God has made, God can direct. Refusal to follow God’s answer to prayer may bring God’s anger. The author did not hesitate to ascribe very human emotions to God, such as anger. This is an expression suggesting God’s firmness and the seriousness with which He views His will. Moses’ continuing excuse-making was unreasonable resistance to the will of God, and God became quite firm in His dealing with Moses. We should not interpret this as God having lost control of Himself. This incident simply expressed the intensity of God’s will in this situation. Family relationships can be used to aid family members in serving God.